Meals on Wheels 25-29 May. NZ Blood Service is collecting blood at the Kaikohe Memorial Hall 8:30am to 1:30pm on Friday 5 May. Polio Plus Fundraiser - a project from the Kerikeri club’s Youth Committee.. There was at least 12 people in the Kaikohe team that supported the Kerikeri club’s Youth Committee and Polio Plus on 13 May at the special screening of Testament of Youth at the Cathay Cinema. ARCO - A new Kaikohe youth project seeking support. Link to information booklet (the link’s fixed). 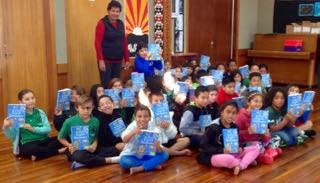 President Liz presented over 40 dictionaries to Kaikohe East students last Friday. Link to Rotary Weekly - 15 May 2015. Link to Rotary Global History Fellowship - Paul Harris #249.